Choosing a top driveway sealer is not an easy thing because there are many types and brands to choose from. But with the experience that I have for sealing and filling driveways for many years, I have selected just a few Henry sealers that I think will be great for any asphalt driveway. Read this Henry Driveway Sealer reviews to know more about this. The Henry stay-black II driveway coating is ideal for filling and sealing blacktop pavements. It will turn your faded driveway into a shiny and beautiful surface. The sealer is made up of an easy to stir gel formula that is easy to apply. It dries very fast and you only have to wait for some few hours before using the driveway. For foot use, you will have to wait for 4 hours while for car use you will need to wait for 24 to 48 hours. With a 7 year warranty, this sealer will last for many years to come. Coverage: 250 to 500 sq. ft. It is not very durable as it leaves marks after a few days of application. Being one of the most famous asphalt driveway sealers, the Henry E-Z stir blacktop sealer will give you the black wet look that every homeowner desires. It is 4x rubberized for durability and covers around 250 to 500 sq. ft. But the coverage also depends on the age and porosity of the surface. In addition, you should consider the climatic conditions at that time. Within 4 hours after application, you should be in a position to use the driveway. 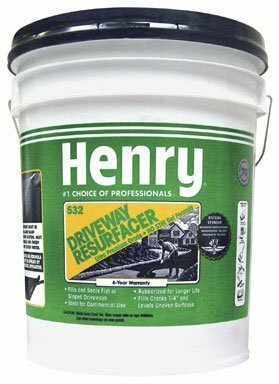 Tired of poor quality asphalt driveway sealers, try out the Henry asphalt resurfacer. This asphalt sealer comes with an easy to stir gel and formula and applying it isn’t a problem. Furthermore, the sealer is 7x rubberized for longer life and long-lastingness. Apart from sealing your driveway, you can also use it to fill cracks in the driveway. Apply it when the temperatures are between 50 to 90 degrees F. To properly apply the formula, use a brush for a smooth application. In less than 24 hours, you will be able to drive your car and in just 4 hours, you can walk on the repaired driveway. Asphalt Dry Time: 24 hr. Henry driveway sealer is a top asphalt sealer brand with reliable sealing and filling products on offer. The three different Henry sealers that we have discussed are some of the best and offer outstanding features. They are suitable for asphalt driveways but not concrete. Choose a sealer that meets your needs and budget. Q. How long should I wait to use my driveway after sealing it? Ans: This varies according to the season. In summer, it will take approximately 2-4 hours to dry but you will have to wait for 24 hours to drive on it. During the spring or fall, it normally takes 24 to 48 hours to dry and around 30 days to drive your car on the sealed driveway. After you’ve applied the seal on the pavement or driveway, you should seal the entrance and exit with tape. Q. How many coatings do I have to apply on my driveway? Ans: It is important to understand that one oat may make the driveway to look good but it is not enough. For a long-lasting and durable asphalt driveway, you need to apply two coats. This will provide more resistance to elements and you won’t have to frequently apply the coat after some time. Q. Can I use the sealer to seal a crack in the driveway? Ans: Of course, you can. This driveway sealer can be utilized for sealing cracks in the pavements or driveway. Though a lot of it will be utilized and you will have to combine it with other substance so that it can stick or bond properly. 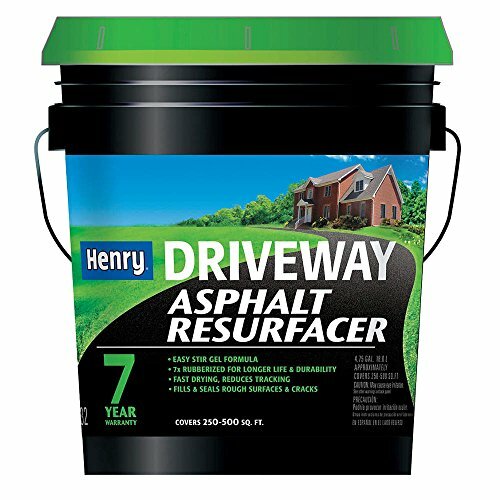 Q. how much will 5 gallons of Henry driveway sealer cover? Ans: 120 sq. ft. 10ft.x12ft. 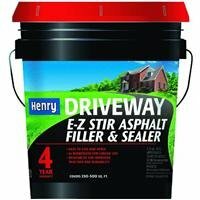 Still, have a question after reading this Henry Driveway Sealer Reviews? Comment below.